Winter takes a real toll on my skin, that is for sure! I notice a dramatic increase in the dryness of my skin every winter, especially with my face. I always struggle finding a moisturizer that will keep up with the dryness with being overly oily. Recently, I have been using the great Radical Renewal Hydrating Cream that I received from Purity of Elements (POE). Purity of Elements is a skincare line created by a mother and daughter duo. With little time to spare, mothers need a skincare routine that’s simple and effective. The POE Restorative Kit helps to repair, renew and reverse signs of aging with a simple, step-by-step system. Complete with a daily cleanser, moisturizer, serum, eye cream and mask, this system offers moms the daily indulgence they deserve! The Radical Renewal Hydrating Cream has been a lifesaver this winter with my face. It goes on smoothly for a moisture that I need without leaving my skin feeling oily. But most, importantly I love the ingredients and what is NOT in the list: SLS, parabens, and other icky ingredients. 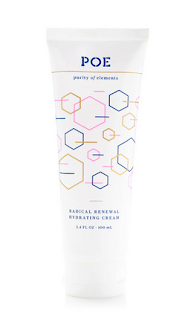 Instead, it combines the synergy of elastin and collagen with nourishing avocado oil rich in essential fatty acids and Vitamin A’s natural Retinol -- the Radical Renewal Hydrating Cream’s concentrated formula hyper-hydrates and reinvigorates dry skin while helping smooth fine lines and wrinkles. Another great product from the POE line is the Mandarin Marine Moisture Mask. A refreshing fusion of Algae Extract, Magnesium, Hyaluronic Acid, and Ginger Root, the Mandarin Marine Moisture Mask hyper-hydrates and fortifies the skin with powerful antioxidants that help build collagen and smooth fine lines. So, if you want to fight the signs of aging NATURALLY and also keep moisturized, try the great products from POE! Buy It: You can purchase The POE – Purity of Elements product collection at dermstore.com and purityofelements.com. 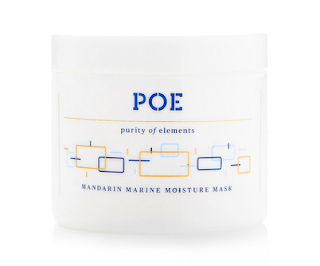 Win It: POE is generously offering (1) Mandarin Marine Moisture Mask to a lucky winner!